Seismological monitoring on Merapi volcano started in 1924 when a mechanical seismograph, Wiechert, was installed at a distance of 9 km to the west of the volcano using this seismograph, Van Padang detected an increase of seismic activity prior to eruption in December 18 1930. Tremor, a term used to describe repetitive seismic events, had been recorded since January 1930 and increased in number/ frequency up until November 1930, just before the extrusion of a new lava at the summit. Over a three-month period in 1968, Shimozuru and his team monitored the activity with seismographs installed at Kaliurang, 6 km south of the volcano and at Selokopo, on the north flank. From the recorded seismic signals, and by comparing with Minakami classification (Japan-ese seismic scheme), they proposed a new classification for Merapi earthquakes (Shimozuru classification). In 1982, a permanent radio-telemetered seismograph network was initiated. Analog drum recorders were placed in MVO-Yogyakarta. Since then eruptions can be monitored more precisely. Seismometers are of 1 Hz, vertical L4C type. In order to improve a good quality signal, better azimuth and elevation coverage, some seismograph positions were changed. Beside that, several additional stations were built. Now, there are eight (8) seismograph stations in the network. In January 1991, the network was completed with a PCEQ-digital recording using DT-2821. VA event. It is the deepest tectonic-like volcano-seismic events known in Merapi volcano. The hypocenter depth ranges from 2 to 5 km below the summit. The P and S phases are clearly separated. Dominant frequency recorded at 2625-m altitude is between 5 to 8 Hz. Amplitude is comparable between all stations because the source is about the same distance from all the stations. VB event. This type is similar in their frequency to the VA events. Due to the close proximity of the hypocenter, the S phase is difficult to accurately identify. The depth of hypocenter is usually less than 1.5 km from the summit. MP event. The term "MP" ("manyphases") was proposed firstly by Shimozuru et al. (1970) to describe seismic events that occur during the lava dome formation. For a given amplitude, MP event has a longer duration than that a V-type event. Further away from the summit, the amplitude is strongly attenuated. The dominant frequency is about 3 to 4 Hz. LF event. This is a low frequency seismic event of about 1.5 Hz. The frequency content is constant from one station to others. The seismograph positioned close to summit records the event with a much higher amplitude than at more distant stations indicating that it has a shallow origin (less than 1 km). Tremor. Tremor is easy to distinguish from other seismic events because of its duration. Its frequency content is similar to that of LF event. Guguran. This is a local term for landslide or rockfall originating from the lava dome. On seismogram signal associated to rockfall has a high frequency content and a long duration. The duration of signal is about equal to the duration of rockfall process. Hypocenter calculation up to present time is done only for VA and VB events. MP and LF events are difficult to localize because the onset of the signal is quite emergence so that identifying the first break is almost impossible. The study of VA events provides an estimate of Vp/Vs in Merapi region of about 1.86. Using this constant and P and S arrival times, the hypocenter of VA and VB events can be calculated. The lack of events at depths more than 5 km may be caused by the presence of magma or a high temperature ductile zone. An non-seismic zone is observed at a depth of about 1.5-km below the summit, situated between the domain of VA events and that of VB ones. It is possible that this indicates the position of an upperlevel small magma pocket or magma batch. Where M is magnitude, n (M) is the number of earthquakes occurring in certain region and during certain period. "a" is a constant related to the seismicity level and "b" is the slope relating big events to small ones. The above relation is justifiable only if Log n(M) has linear relation with magnitude M that is not the case in some volcanic regions where earthquakes occur with various mechanism. The cut-off magnitudes for VA and VB events are approximately the same, about M=2.0. The linearity is valid for M down to 0.7 with a constant b=0.8. However, the frequency-magnitude relation does not exhibit any corresponding linear relation for MP events. Occurrence rate (constant "a" for a given time period) of VB events is about five times that of VA ones. The phenomena of swarm, that is group of successive events, almost always occurs for MP events during a dome formation. The rate can exceed 500 events per hour. In several cases swarms of VB events can last in several hours. However, the rate is much lower than that of MP events, up to 12 event/hour. Another case of Merapi earthquakes is the presence of many similar VB events (multiplets). Two events that occur in different time of several months may have a similar signal in their seismograms. About 30% of VB events belong to the groups of multiplets. This indicates that some VB event originates from repeated reactivating of existing fractures or faults. Merapi volcano has a low seismicity level. Among the existing volcanic earthquakes, only MP events can persist over a several month period. Seismicity can be represented in the number of events per day. From the observation of Merapi seismicity from 1983 to 1994, during the active period VA and VB events together have an average rate of more than 1 event/day. Whereas the normal backgrounds condition, it drops to less than 3 events/month. For MP events, in the normal background state, it has a rate of less than 8 events/day, usually 2 to 3 events/day. However this value can not be used as a strict limit separating between normal and active periods. From March 1994 to November 1994, for instance, in average, there were about 28 event/day. The occurrences of "Guguran" indicate the stability of the lava dome. When the dome is unstable, guguran occurrences may have a rate of up to more than 500 events/day. Whereas, when the dome is stable, only 3 events per day occur. A rate of >50 event/day can usually be used to indicate that the dome is in an unstable state. From the analysis of 12 years of data, it can be shown that the occurrences of Gugurans are closely related to the presence of MP events although this is not a causal relation. MP and guguran both are related to dome growth. MP events occur lava effusion and dome construction. Gugurans also usually occur during dome formation and during formation the dome tends to be unstable. Thus, MP event represents an indigenous factor and Guguran represents an exogenous one. Geomagnetic monitoring in Merapi volcano has been carried out by MVO-VSI since 1977 in the framework of the Indonesia-French cooperation on volcanology. The Commissariat a l�Energie Atomique-Laboratoire d�Electronique et de Technologie de l�Informatique (CEA-LETI) had introduced a proton precision magnetometer at Merapi to monitor continuously total magnetic field intensity with a sensitivity 0.01 nT. With such a high sensitivity, this instrument is capable of measuring ppm fractions of the earth magnetic field. The sensor is based on a proton NMR with dynamic polarization. The output of the sensor is amplified using an associated electronic circuit, then transmitted in frequency modulation by radio to the Merapi Volcano Observatory (MVO). Before 1990 the output of sensor was transmitted to the Plawangan Observatory and the signal was recorded by analog system. Since 1990 at MVO the four signals (from the old station : LEM, CEM, IJO and MER) are submitted to digital processing using a specialized frequencymeter. The acquisition of data is reduced to 1 sample/minute in order to minimize data size. Since April 1996 the Laboratoire de Geophysique d�Orleans/LGO have added a further 2 stations at Pusunglondon (PUS) and Klatakan (KLA). Those sensors continuously measure the total geomagnetic intensity with a sampling rate of 1 data sample/minute. 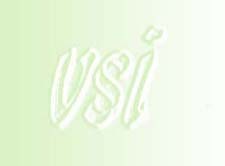 Signals from both stations are transmitted by modem in ASCII code to MVO. The received data is then stored on PC together with GPS-synchronized timing signal. Two stations (LEM and MER) are taken as references. They are quite distant from the volcano and therefore the influence of volcanomagnetic effect is assumed negligible. Magnetic data is analyzed by using a differential method. All geomagnetic stations installed on the eastern and northern flanks of Merapi volcano exhibit different characteristics in data variation over the period from 1990 to 1996. In general, there were four significant changes in total geomagnetic intensity associated with four main volcanic crises. The crises and eruptions occurred on February 2, 1992, November 23, 1994, November 23, 1995 and August 9, 1996. The differences in intensity at CEM, IJO and MER showed magnetic variation of several nanoteslas. Short-term changes were clearly observed in January 1992, November-December 1995 and July-August 1996. Although there was a trend in the magnetic curve of less than 1.5 nT, the monthly average of magnetic variation at CEM shows a gentle increase. 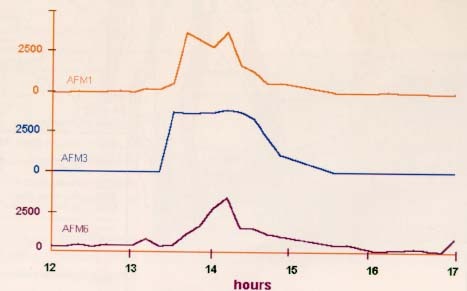 Prior to the eruption the intensity decrease by about 0.5 nT. Example of the variation of differential magnetic intensity between station IJO and LEM. During volcanic eruption, an enormous volume of substance that constitutes the earth�s crust moves up to the earth�s surface as lava flows and/or fragmented ejectas. The effusion of lava is always accompanied by deformation of the earth�s surface. The change of the state in the earth�s crust seems to have a close relation to mechanism of volcanic eruption. Injection of deep magma beneath or into volcanic edifice usually results a small but detectable inflation of the edifice; such inflation can be temporary or permanent. A relaxation of stresses, either by eruptions or migration of magma into lateral fissures, might result in a deflation around volcano edifice. The area of deformation is a function of size, shape and depth of the magma body; the quantity of measured deformation is a function of these same variables and the position of measurement point relative to the magma body. Deformation rate depends on all the above variables and on the rate of magma injection. Trilateration is one of the methods of surveying based on the trigonometric proportion that if three sides (laterals) of a triangle are known, the three angles can be computed. In the field, three sides of a triangle are measured by EDM (Electrooptical Distance Measurement). The relative vertical angle of each points in the triangle are measured by theodolite. This means that trilateration measurement is to measure combination of vertical angles and distances of any triangles. EDM is an instrument to measure distance by emitting a modulated visible or infrared light beam and analyzing the phase shift of the signal reflected by a passive retro-reflector located at distant sites. In the case of Merapi, the angle and the slope distances are measured by WILD Theodolite T-2 and WILD EDM DI3000. The theodolite has one second resolution, and the EDM DI3000 has a range up to 19 km with standard deviation of 3 mm + 1 ppm (part per million or 1 mm per 1 km). 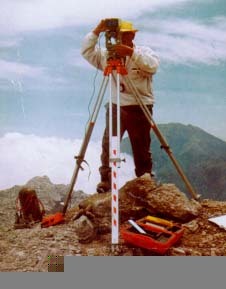 At Merapi volcano, a geodetic network was established in 1988. It was applied to monitor ground surface deformation of upper part of Merapi�s edifice. This summit network is designed to provide a record of edifice displacement and strain preceding and following eruptive episodes and dome evolution. Reference points for the network are the existing geodetic points at Pusunglondon (GQ-2) and Selokopo-dhuwur (GQ-1). The other points in the summit are observation points, which are linked to those, reference ones. Assuming that the movements of the base line is zero, diplacement analysis of summit stations can be conducted. EDM survey has been done periodically once a year since 1988. 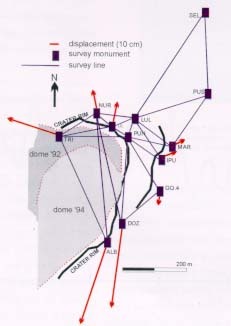 In July 1991, deformation measurement was done for the summit network. Data analysis found a movement of the summit points ranging from 20 to 80 cm for distance between observed points of 200 to 400 m apart. This was a cumulative extension since 1988. According to the configuration of the network, this movement resulted from crater extension. Deformation was generally tangential, especially for the line traversing the crater. In the period of 1991-1992, there was a radial contraction. Note that an eruption occurred on February 1992. It is possible that the radial extension in the period of 1988-1991 associated with the increasing of long-term gradual pressure preceding the eruption, whereas the 1991-1992�s radial contraction might be related to a relaxation mechanism. sketch fo the triateration network on the summit and the result of deformation measurement from 1988 to 1992. The extension of the crater rim can attain 1 meter over this four-year period. Measuring deformation with EDM instrument in the trialteration network on the summit at the point named NUR in Mt.Merbabu(photo:Nandaka). Some tiltmeters have been installed on Merapi volcano in the framework of cooperation between: Indonesia-USA, Indonesia-French, Indonesia-Japan and Indonesia-Germany. 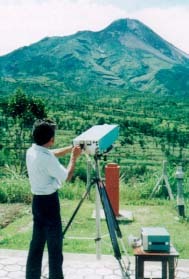 Tilt monitoring in Merapi was introduced in 1990. Two platform tiltmeters were installed on the dome. Due to problem of field condition, especially corrosion by volcanic gases, both tiltmeters lasted only for several months. In November 1992 the first network of four tiltmeter stations was installed around the Merapi lava dome. The tiltmeters are AGI-700, single axes radial oriented relative to the center of the dome. These instruments measure horizontal tilt of two gain options, high and low, with a sensitivity of 0.005 and 0.5 urad/mV, and a full-scale range of 400 and 2000 urad, respectively. Platform tiltmeters were put on the ceramic tiles covered with plastic bucket on approximately 2 to 3 m boulder size buried in the ground. Each instrument transmits signals every 10 minutes to the base station at MVO-Yogyakarta. Data is recorded on PC. In 1993, a platform tiltmeter unit of AGI-701 was installed in the bunker at Babadan observation post, 4-km northwest of the summit. Data is stored in a field logger with a sampling taken every 30 minutes. 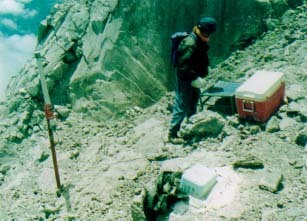 In November 1994, several weeks before the dome collapse, another similar tiltmeter was installed in Pusunglondon (2500m), about 500-m northeast from the crater. Later, in October 1995, it was shifted to Pasarbubar. In March 1995, three additional stations were put in Babadan, Pusunglondon and Klathakan (1800m). Data is telemetered to MVO with a sampling period of 15 minutes and recorded on PC. In October 1995, BLUM glass-tiltmeters were installed on the summit and at Deles (1400m) with a resolution of about 0.1 to 0.02 �rad. All tilt data from the summit is telemetered to MVO, whereas one of Deles is stored in a field datalogger. The instruments are placed within a box and buried in the ground to prevent air temperature effect. The sampling is taken for every 10 minutes. The station is completed with a temperature sensor. Borehole tiltmeters are installed in Selo (2100), North flank of Merapi in May 1995 and in Kendil (1400m), South flank of Merapi in October 1995. These are AGI-722 tiltmeter placed at a hole of 3-4 m depth and protected with concrete casing. The stations are equipped with GPS and weather sensors. Data is stored in a field data logger. In the long and medium term, monitoring ground deformation by tiltmeter allows to observe subtle inflation-deflation processes associated with magmatic activity of the volcano. The tilt variation in the summit is about ten times larger than that at the flank. Especially in the case of lava outflow or dome formation, variation on tilt data has a correlation with seismic MP events. Prior to the doming period of February-October 1993, there was an inflation rate of about 4-8 urad. 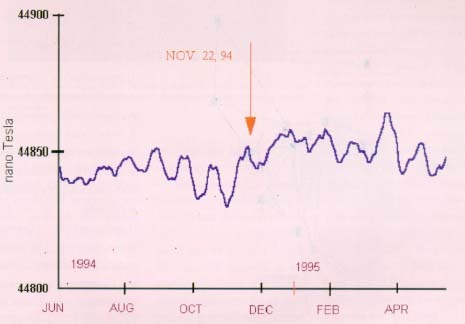 The summit tiltmeter also observed an inflation rate of 18 urad/day during the period of 2 - 14 days before the dome collapse in November 22, 1994. Geochemical monitoring applied on Merapi volcano has been periodically carried out since 1984. Studies on the chemical composition of high temperature volcanic gases indicate that the composition depends on temperature, the method of sampling, and the stage of volcanic activity. 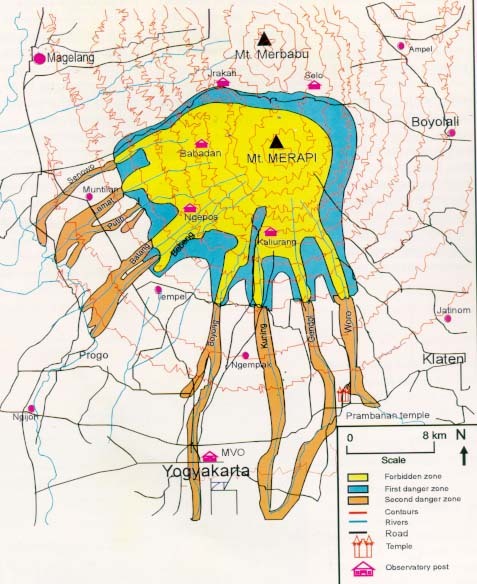 Merapi volcano has two main solfatara fields: Gendol and Woro. In each fields, there are several fixed points where sampling is routinely done. According to past experiences, fixed measurement point at the Gendol field is considered as the best place for gas sampling. The analysis of isotope composition found that the concentration of Deuterium and Oxygen (18O) elements are = - 24.0 � and = + 6.1�, respectively. Results indicate that the H2O content in the volcanic gas of Gendol originates directly from the magma body without any contamination of meteoric water. In contrast, those of Woro contain a minor contamination of meteoric water. Analysis of water composition is also routinely carried out at water springs located at the upper reaches of rivers, major tributaries around Merapi volcano, namely: Boyong, Kuning, Krasak Cilik, Bebeng, Senowo, Trising and Apu rivers. Photograph showing the location at Gendol solfatara field where gas, condensat are sampled. This is also the classical site to measure the temperature of the gas. As a preparation in the laboratory, a single cylindrical flask made of Pyrex glass with Teflon stopcock is filled with 4N NaOH solution up to 1/5 of total volume of the flask. Then the flask is evacuated until final pressure up to -1,000 mbar and weighed. In the field, a titanium pipe is deeply inserted into the solfataric vent and then a silica pipe with smaller diameter is plugged into the titanium one. Subsequently, the pre-vacuum flask is connected with the silica pipe through a silicon rubber. By opening the stopcock of flask gently, solfataric gas is admitted. The gas flow decreases because vapor pressure in the flask becomes progressively higher. The sampling is stopped, by closing the stopcock, when the gas pressure reaches about atmospheric pressure. Back to the laboratory, concentrations of H2, O2+Ar, N2, CO are determined using Gas chromatograph PYE UNICAM 4550. Water content is also measured by observing the volume increase of aqueous solution in the flask. HCl, SO2 and H2S are also routinely analyzed. Decreasing H2O and increasing CO2, SO2, H2S, HCl, N2 concentrations usually preceed an eruption. H2 and O2 on the other hand did not change significantly in concentration prior to, for example, the crises of August 1990, February 1992, August 1992, and of November 1994. Several crises exhibit an increase of H2/H2S, CO/CO2 and a decrease of CO2/H2O, HCl/H2O ratios few months prior to the eruption. It is clear that there is a close relationship between those ratios and eruptive activity. The non-absorbed light gases are including H2, O2 + Ar (Argon in a very small quantity), N2 and CO. The SO2 flux from Merapi volcano is measured remotely by using Correlation Spectrophotometer (COSPEC) from a fixed distance. The ultra violet is used to monitor the SO2 contents in the volcanic plume utilizing the molecular absorption characteristic of SO2. where A is absorbantion; a is absorbant coefficient; b is path length of medium and c is concentration. 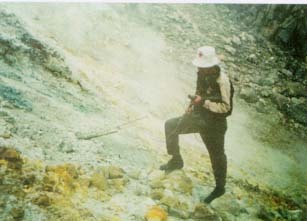 On Merapi, since 1984 to 1989, the determination of SO2 emission rates has been routinely conducted from Kaliurang (about 6 km to the south of the summit). Daily measurements have also been carried out from Jrakah Observatory, about 5.7 km to the north of the summit. Long term SO2 flux shows that the flux tends to decrease slowly, down to less than 100 tons/day a few months before eruption and then began to increase just before eruptive activity. It suggests that a new batch of deep magma has moved to shallow reservoir position. During the movement of magma, SO2 accumulated and may be trapped in the shallow reservoir. To reach out the surface O2 was plugged by the existing lava dome in the crater while magma continuously moved upward entering the vicinity of shallow reservoir, fluid accumulation occurred. The accumulation of the fluid causes the temperature and pressure of the conduit also increase. The supersaturated pressure of the volatile can open cracks and possibly trigger eruption. The November 22, 1994 pyroclastic flow was preceded by slowly decreasing of daily SO2 flux four months prior to the eruption from 104 ton/day to 63 ton/day on monthly average basis. After that the emission rates increased to 142 ton/day in the beginning of November 1994. This condition was continuously increased till the eruption. The February 2, 1992 eruption was characterized by an emission rates of SO2 less than 100 tons/day from October 1991 until February 1992. On February 11, 1992 the emission sharply increased with the maximum rate of 361 tons/day. This increases may be related to decompression of the volatile-supersaturated magma and subsequent separation of the volatile phase lead to the increasing SO2. Since July 1993 SO2 flux decreased gradually. The emission rate of SO2 flux of Merapi in a normal active stage is about 100 tons/day. Long term daily flux tends to decrease to less than 50 tons/day and then began to increase again just before the eruption. The maximum rate obtained was about 250 ton/day. From the written history of Merapi volcano, it is certain that summit morphology changes easily due to eruptive activity. Since 1961, the only change is inside the crater. Alternation of dome formation and dome collapse occurs frequently. As the direction of pyroclastic flows depends strongly on summit morphology and the condition and the position of the dome, visual observation of the summit and the dome is undertaken by the Merapi Volcano Observatory. Detailed observation of the crater is directly done from the summit. A "summit" team is sent to the summit to take photographs of the crater and the dome. From the successive photograph, the evolution of the dome can be reconstructed. The team also notes any changes in solfatara vapor and temperature. Each observation post: Kaliurang, Ngepos, Babadan, Jrakah and Selo, is equipped with a telescope to observe, if any, every change in the upper part of the volcano. The observer should attentively observe activities on the dome and note where rockfalls originate, direction and distance traveled by avalanches, which part of the dome is growing, height of the volcanic smoke, etc. Information about the condition and the morphology of the volcano from the post is reported to the MVO. The report includes also data concerning air temperature in the post, daily maximum and minimum temperature, rainfall and cloud condition. To improve dome monitoring, in November 1993, MVO in collaboration with LGIT-Grenoble operates two telescope cameras with a focal length of 1000 mm. The advantage of having a powerful focal length is that we can place it far away from the volcano so that even in a crisis period the condition of the summit can still be observed, In principal, photograph should be taken once a day in a good weather condition. One telescope camera is set in Ngepos observatory about 12 km from the volcano. From such a distance a displacement of the dome up to about 0.2-m can be monitored. Lahar is one of the important secondary hazards in Merapi. In 1975, lahar in the Krasak river has crushed the bridge connecting two provinces Yogyakarta and Central Java at Salam-Magelang. The bridge is situated at about 25 km Southwest from the summit. Material of this lahar was the product of 1967-1969 eruption of Merapi volcano. The most recent example of lahar was that occurred in December 5 1996 at Boyong river, south of the volcano. Although the quantity was much smaller than that of 1975, it was easily to remind because of the sinking of about 14 trucks. They are some of trucks collecting sands and gravel from the river for building materials. About 150.000 m3 of material was transported downstream of the Boyong river. 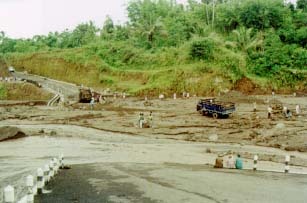 The lahar material is a part of the product of 1994�s dome collapse accumulated in Boyong river. Lahar monitoring is done in MVO in two steps. First, by estimating the potential volume of lahar material which equals to the volume of loose materials at the slope. Second, by monitoring lahar flow using a detector placed near some river channels. Lahar event is usually trigger by a heavy rainfall. About 50-mm/hour rain is supposed to be critical for lahar triggering if it falls in an unconsolidated materials. Water flow becomes stronger in energy as it brings ash, sand, gravel and stones in a mixed suspension. Water content in a lahar can be down to only 30%. When there is lahar, the flow of material generates an acoustic noise, which travels in the ground. This high frequency noise can be captured by an acoustic sensor. The sensor is high frequency geophone with a frequency of higher than 10 Hz. Working frequency is at 10 to 250 Hz. This frequency is divided into two bands: high frequency band, 100-250 Hz, high gain, for water flow detection and low band, 10-100 HZ, high gain, for lahar detection. An input gate for all band low gain signal, 10-250 Hz is available for monitoring voluminous laharic flow. The field unit is completed also with rainfall gauge and a sensor for a battery condition. In the field, signal is amplified and then transmitted to the recording station at MVO-Yogyakarta. The on-line concept of lahar monitoring is important because lahar might happen within several minutes after the heavy rain starts. In MVO, data can be presented at any time. A detection of water flow (high frequency band) is used as the emergency warning prior to lahar triggering. 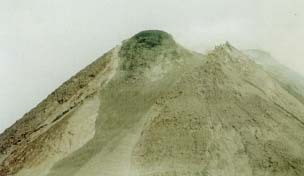 In connection with lahar detection, MVO operates also a rain gauge placed at the summit of the volcano. Rainfall rate data is sent by radio transmission to Ngepos observation post. Rainfall is converted to frequency and then, in the receiving station, a processor counts shifting repetition and reconverts it to rainfall rate. The onset times of the activities of Merapi in October 1986, in November 1994 and in 31 August 1996 coincided with the rain events in the summit. The presence of a rain gauge in the summit is then expected to be able to justify if a volcanic crisis is triggered by rain. This is possible because dome stability (or security factor of dome slope) is easily drops due to interference of water. In addition, the five observation posts around the volcano are also equipped with manual rain gauge. During the rainy season, from October to April, rain and lahar monitoring needs more attention to be paid. AFM(amplitude flow measurement) in December 5,1996 showing the chronology of the lahar process.